Publisher Focus Home Interactive has announced its partnership with Deck13, the developer behind Lords of the Fallen, for a new RPG set in a dystopian future. The unnanounced RPG will be revealed later but we already know it's coming in 2017 for PC, PS4 and One. Of the new partnership, Deck13 Interactive CEO’s Florian Stadlbauer and Jan Klose said, respectively, "We are delighted to be working with Focus Home Interactive. Our relationship with the company over the past few months has created a lot of trust and confidence already. During the past years, the Focus team has shown that they are extremely successful in marketing European titles worldwide." Klose, CEO and Creative Director, stated "After our recent major project, the team at Deck13 is eager to take on the next challenge. We have learned a lot and want to deliver an even greater experience to core gamers this time." "The new game will feature innovative combat mechanics and an original character progression system based on modular upgrades gained through tight, visceral combat." 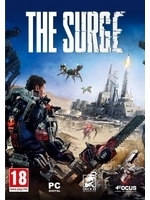 The guy in the artwork looks like has that Advance Warfare exosuit thing going on, which i never say no to.